Good list , agree with most of your choices except the DAW – Obviously it’s down to personal preferences but I prefer Cubasis over Auria . As a beginner / intermediate iOS musician I find Cubasis to be much more user friendly and fun to use ……. Obviously doesn’t have all the pro features , but it does enough for what I need to do. 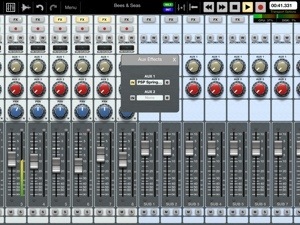 I also think Multitrack Daw is unbeatable for iPod touch / iPhone use . I am assuming this is iPad focused. Many of these apps don’t exist on the iPhone. In addition to the two criteria you mentioned of audiobus and audiocopy my 3rd criteria is that an iPhone version (iPhone 5 compatible obviously) should be available. DAW is Multitrack DAW. Auria doesn’t have an iPhone version (not does cubasis). FX: echo pad is downloading right now as I type this, and I use JamUp XT Pro with a couple of add-on packs from their store. Instruments: I love thumbjam. The quality of instruments is just fantastic once you get used to the slightly quirky style of playing it, it is a joy to play on. Chordbot: this developer has a good thing going, I tell ya!